I’ve always been fascinated by food trends. The past few years it’s been all about kale and why it’s the only vegetable you should be eating in salads, smoothies, baked as chips and more. But just the other day I read a lengthy article about an author who was breaking up with kale. Should you really break up with healthy foods?! The past few months all I’ve seen are recipes containing bone broth. Asian countries have been making bone broth for centuries using it as a base in luscious soups. A few months ago a bone broth shop opened in New York City offering large cups of the warm, healing, immune boosting broth as an alternative to your usual Starbucks pitstop. 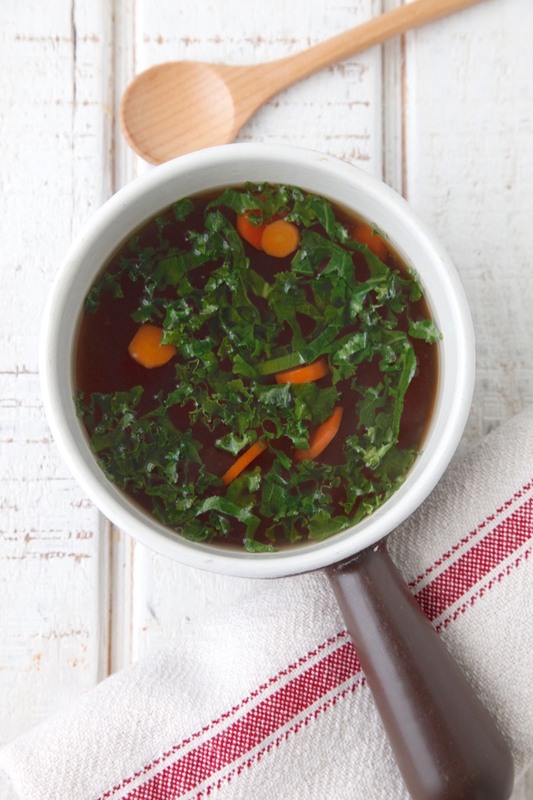 Is it even possible that broth could ever replace your morning java? Try some and you will see why it’s so addictive. Following my dear friend Keri’s recipe I made this mineral rich infusion several times on the stove, but as she indicated, the best bone broths are made for 48-72 hours. Not being one to want to leave the flame of my stove on for hours unattended I made the same recipe in a slow cooker. 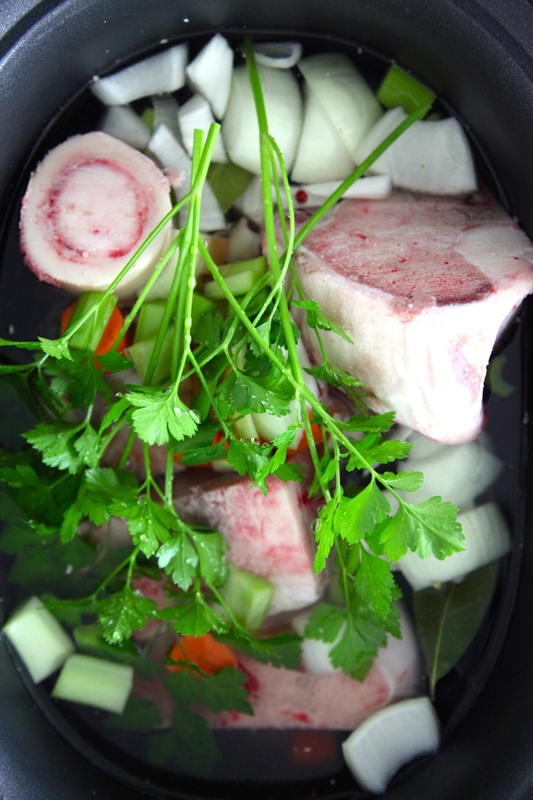 If you decide to make one recipe this weekend I hope it’s this healing Slow Cooker Bone Broth. I take grass fed beef bones I get from our farmers market, local butchers or health food store, a little apple cider vinegar to aid in breaking down the cartilage and mix them in my slow cooker with tons of organic vegetables. You can’t imagine how incredible the broth smells as it’s bubbling away for up to 3 days. It gets better and better by the hour. After it’s cooked and cooled you can refrigerate it to allow the thick layer of oils to solidify, so you just peel them right off offering a clear, nutrient packed broth that will heal even the sickest person. I’ve made and frozen so much of this broth in the past few weeks so that I can defrost a batch and add all kinds of additions like ramen noodles, chopped meat, thinly sliced kale, carrots and more. 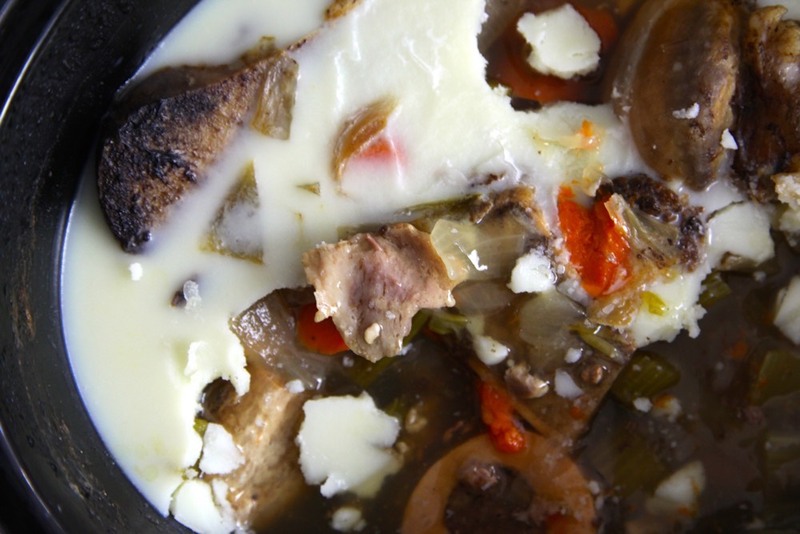 Anything you would add to a clear soup you could add to this fragrant broth. It’s one of those foods, whether a trend or not, that’s essential to keep around when your family is feeling under the weather and needs an instant pick me up! 1. Place the beef bones in the slow cooker, and place the remaining ingredients on top. 2. Add enough water to the slow cooker to cover everything. 3. Cover, set the slow cooker to high, and cook for 24-72 hours. 4. Strain the liquid, place in the refrigerator to cool, remove the solidified fat from the top, and use as desired. If you look at the last photo in the post you can see that I place the entire crock pot in the fridge to let the broth cool and the fat solidify. Then I just peel off the thick layer of fat from the top and discard everything else that isn't broth! do the Beef Bones need to be roasted first? Nope! That does add a little more flavor, so you can do that if you would like, but it isn't necessary! The bones needs to be soaked in the water for a few hours to let the blood or anything that isn't clean released out. Then boil the bones and throw the broth. We don't want to use the broth from the first batch. After, the Bones should be washed thoroughly. And now it is ready to use it for the bone soup recipe you've posted. The bones can be used to make the broth as many times as you would like.. I just wanted to share this with you. I have a 6.5 quart slow cooker! I have been intimidated to make bone broth. I think starting with chicken would be easier for my family to utilize. Can you do a chicken in crock pot the same way? Would I use a chix that's already been roasted? And how long to cook it? I'll read other comments in case a subscriber answers if Catherine doesn't get to all my questions. Thanks. We have been doing chicken broth for a couple of years. We make it once a week and we each drink a cup of the bone broth with our breakfast every weekday morning. We tend to get a 4 pound chicken and do it for 5-8 hours on the stove, I don't use a chicken that's already been roasted. The next day, I use the chicken from the broth for either chicken taquitos, shredded in a quesadilla or chicken enchiladas. We've also thrown it into a pasta so nothing goes to waste. You could totally use chicken bones instead of beef bones! You'll want to use raw chicken bones because this cooks for such a long time. Bone broth has so much flavor! I love your slow cooker method, I can't wait to give it a try! This was a good one with which to get on the broth bandwagon! Way to go, Catherine! does it matter what type of beef bones? what would be the cheapest? I use beef bones for my puppy. I use 2 big beef bone (about 2 pounds total) I get at the grocery store and add 2 cans of vegetable broth to the bones and cook them on the stove for about 1 hour. I check the internal temperature of the bones so they are at least 165 degrees. The puppy loves the bones and I can use the broth for soup. Does anyone else do this? How much broth do you typically get from this recipe? I'd probably have to halve it because my cooker is on the small side, so I'm curious how much final product you get with the recipe as it's written. This will make about 4 quarts of broth! My acupuncturist recommended I make this same type of \"bone broth\" and drink it each morning for the health benefits. I have to say it was a little hard drinking it down at first, and my family did not like the idea (or smells in the beginning). But you have reminded me that it is very important for my health and recovery from acute/chronic pain and nerve damage. Thanks for your recipe. Do you put your slow cooker on high or low? The video said high, the recipe says low. Should the broth in the slow cooker be at a low boil? Eek, don't give your dog cooked bones! They can splinter and pierce their throat and stomach. Read up on the raw diet if you want to give bones to your dog. some dogs can even splinter raw bones. The video says to put it on low for 24-72 hours, but the written recipe above says to cook on high for 24-72 hours. Which is it? How do you get 12 pounds of bones in your slow cooker?